– In training, methods are assumed to be context-independent, and that each method will lead always to the same outcomes, regardless of who or what applies that method. Because of this, everyone is taught the same method. (For computer-based machines, such training is typically termed ‘programming’.) In effect, method is the sole centre of focus, with context either ignored or deemed irrelevant. – In skills-based work, methods are assumed to be somewhat context-dependent, and that use of the same methods in different contexts may or will lead to different outcomes. Which means that different methods will likely need to be applied, dependent on the context – human or otherwise – in order to achieve the equivalent outcome. 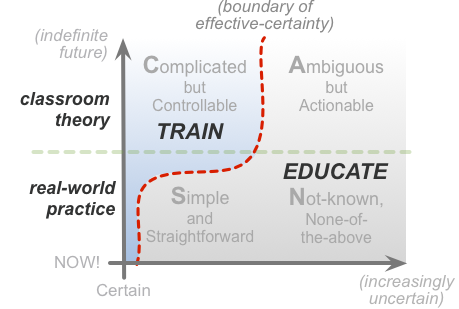 Which means, in turn, that we can’t just teach the same method in each case, because it may well work only with one person in one context – and that agents that cannot adapt to context, such as many if not most current computer-based technologies, cannot be relied upon to deliver the desired outcomes. 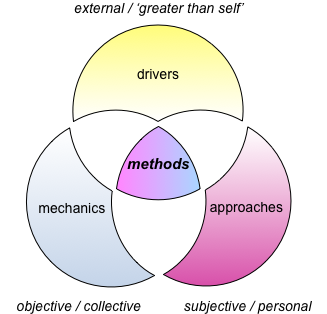 In effect, the appropriate method to use in each context arises from a context-specific mix of ‘objective’ and ‘subjective’ factors – respectively the ‘mechanics’ and ‘approaches’ in the context – and hence the key focus needs to be on those factors, rather than on specific methods that arise from them.